After learn­ing your way around the Hud­son Valley’s venues and ven­dors, there are a num­ber of items that your Hud­son Val­ley wed­ding can’t be with­out. Here we comb the inter­net for fun and use­ful items for your big wed­ding day event. BTW — click­ing on a link when you pur­chase helps keeps this blog run­ning with­out heavy adver­tis­ing. Look around, have fun, and let us know how you like our sug­ges­tions or if there’s any­thing else you think should be added to this list. Great for Do-It-Your­selfers mak­ing their own pho­to booths. These Great Gats­by-era props make great quick dis­guis­es for your guests as they cre­ate awe­some Roar­ing 20’s wed­ding self­ies. 25 props in all. Because DIY pho­to booth is com­plete with­out a sign invit­ing your guests to grab a prop and snap away, this 2-sided pho­to booth sign is a must. Moon Hand­books are known for their qual­i­ty maps and inspir­ing trav­el advice for des­ti­na­tions across the globe. 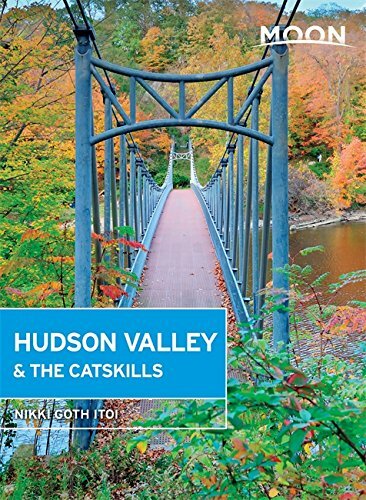 Their recent­ly updat­ed Hud­son Val­ley & the Catskills is one of the best trav­el guides we’ve seen for our area, and an excel­lent start­ing place for out-of-town brides who want to get mar­ried in our region, but don’t know where to start. Infor­ma­tion is bro­ken down by sub-regions with itin­er­aries to suit a range of tastes, from food­ies to his­to­ry buffs, to cyclists. High­ly rec­om­mend­ed to get your plan­ning on! You’ve spent a lot of time com­ing up with your unique Insta­gram wed­ding hash­tag. Now it deserves a great dis­play, like this vin­tage style chalk­board by Gin­ger Ray. They’re cheap enough and com­pact enough to place on every table at your recep­tion to remind your guests where to post snap­shots of your big day. Cus­tomized dress hang­ers are pret­ty to shoot dur­ing bride get­ting ready time. They also make great keep­sakes. You can get these cus­tomized wood­en hang­ers through Ama­zon. You can choose your wood fin­ish (Vintage,Chestnut,Black,White, or Nat­ur­al Wood); bow col­or (16 choic­es); and laser engrav­ing on the right and left sides with up to 20 char­ac­ters for your name, wed­ding date, etc. As for the wire, it can spell out a name up to 15 char­ac­ters in length or you can go for sim­ply “Bride”. So you’ve said your vows, and now you want to tell the world in your first pho­tos as a mar­ried cou­ple. There’s noth­ing like a Just Mar­ried ban­ner for the job, espe­cial­ly this one made of high qual­i­ty card­stock and jute. You can also place it one your sweet­heart table or attach it to your get­away car!